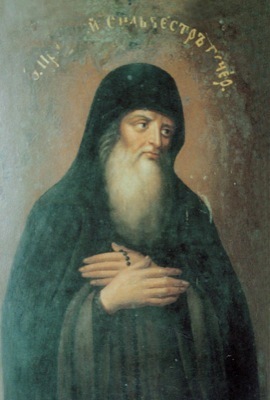 Saint Sylvester of the Caves lived during the twelfth century and was igumen of the Mikhailovsk Vydubitsk monastery at Kiev. He continued the work of Saint Nestor the Chronicler (October 27) and he wrote nine Lives of the holy saints of the Kiev Caves. In the service to the Fathers venerated in the Near Caves, Saint Sylvester is called blessed and endowed with “a miraculous gift to ward off demonic suggestions (Ode 9 of the Canon). Saint Sylvester was buried in the Near Caves, and his memory is celebrated on September 28, and on the second Sunday of Great Lent.